First: you’re having a small Thanksgiving. Maybe the budget is a little tight this year — maybe you got hit by the recent government shutdown — and the idea of flying to another state, and contending with a hotel, and managing the maintenance of your progeny is more than you can bear. And so you invite four or five friends, similarly stranded, to your house to share a meal, a couple of bottles of off-dry riesling, and — if you’re absolutely nothing like me — the gladiatorial rumble of two matched teams playing at American football. Second: you’re having a massive Thanksgiving. Perhaps you are one half of a newly wedded couple. And as such, it falls to your house, and to your hospitality, to host your parents and your partner’s folks, your Aunties Grace, Lilly, and Cecelia (all very fertile in their earlier years) and your partner’s cousin Pat who, you are informed, never really got the message about birth control. You’re good on a whole turkey. You’ve got a recipe for roasting right here. But with twenty hungry family members, none of whom know each other very well, you know — know! — that one bird isn’t going to be quite enough. They’ll eat a turkey and a half, you think, and if I’m not careful, they’ll eat the platter and part of the countertop, too. It’s a high stress situation, and you’re looking for a way to cope. To both of these scenarios, I offer the roast turkey breast roulade as a solution. This little guy has the wondrous property of being just the right size when you don’t want to serve too much meat, and just the right size when you don’t have quite enough to go around. Turkey breasts tend to be somewhere between three and five pounds. They’re a satisfactory solution for that strange faction of people who insist that white meat — despite its obvious shortcomings — is somehow more desirable than the drumsticks, or the thighs, or that most delicious of all the turkey members: the neck. And the cool thing about a turkey breast is that, unlike that big motherclucker you always ate at the holidays when you were a kid, this iteration is okay to stuff. Stuffing a whole bird is kind of a catch-22 situation. On the one side, you can choose to cook your bird until the deepest part of the stuffing is 165F and safe to eat. But on the other, if you do indeed do that, you end up with leathery meat, burnt wingtips, and an outcry from your older relatives that this is nothing — nothing! — like as good as the birds Grandma Biddy used to make in the old days before we knew about salmonella. But the breast is a bird of a different feather (so to speak). It’s easily butterflied, pounded, and molded, then wrapped up tight around mounds of whatever delicious, moist mixture you care to trap inside. Fully cooked, it’s not going to be tender. It is still white-meat turkey, after all. But it takes on the flavors of whatever goodies you use in the stuffing. It slices up nicely for you and about six guests. And though it’s simple to put together, it looks impressive enough to make you seem like a hotshot in the kitchen. 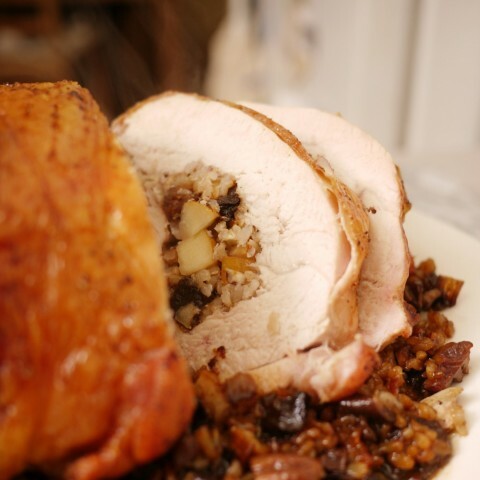 This particular roast turkey breast roulade is stuffed with apples and prunes, nuts and rice. I recognize that there are a lot of folks out there who’ll look at this and go: Prunes? Eew! And ordinarily — in almost any other context — I’d agree with you. 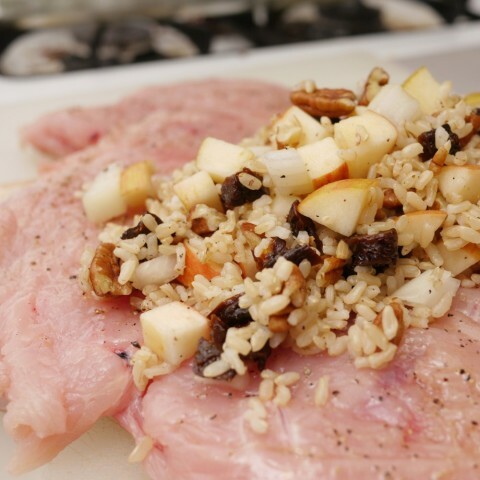 But I assure you that prunes cooked with poultry, especially in the presence of apples and onions, are singularly delicious. So try it before you knock it. You won’t be sorry. Preheat your oven to 375F. 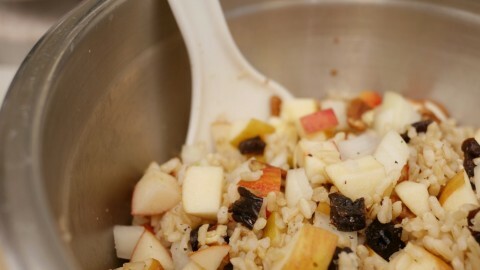 To a medium bowl, add the rice, apples, prunes, pecans, and onions. Season with salt, pepper, and dried thyme, and then mix thoroughly. On a large cutting board, butterfly the turkey breast. To do this, lay it skin side down. Using a sharp knife, slit the tenderloin section such that it flips outward. Then, making shallow cuts, slice horizontally into the muscle of the breast proper, cutting almost all the way through until it too flaps out, but in the other direction. 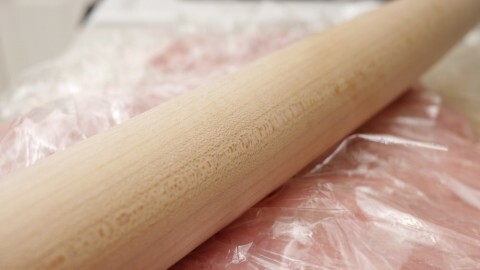 When the breast is butterflied, cover it with a couple of sheets of plastic wrap, and use a meat mallet or rolling pin to pound it, spreading it until it is evenly thick — a bit less than an inch all over. Season with salt and pepper. Spread a layer of the stuffing over the breast, leaving about two inches on all sides. 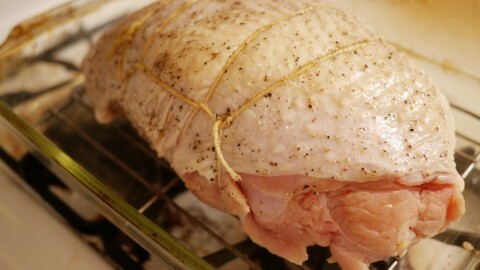 Then tightly roll the breast up, making sure to keep the skin side on the top. As you roll, the stuffing should spread to cover the entire interior of the roast. 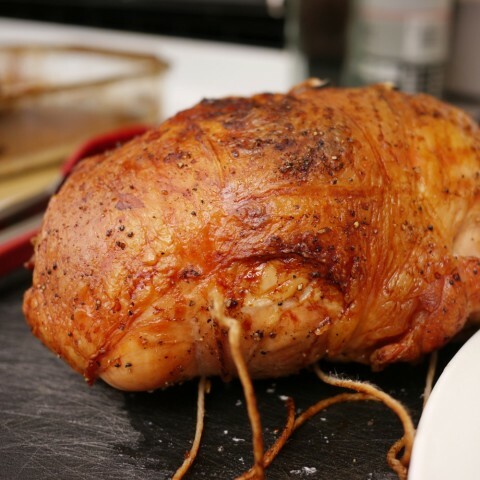 Tie the turkey breast with twine. Rub it all over with more salt, pepper, and olive oil. Spread the remainder of the stuffing in the bottom of the roasting pan, and position the roulade on top. Insert the probe thermometer into the thickest part of the breast. And then put in into the oven. When the turkey breast roulade reaches 120F, or so, baste with the stock and wine. When it reaches 165F, it is done. Allow the finished roulade to stand for at least twenty minutes. 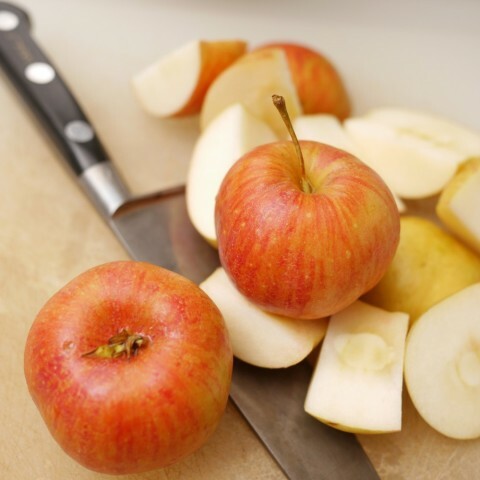 Then serve at the table, cutting half-inch slices for each of your guests. They will be terribly impressed. And only you will know just how dead simple it was to make. I’m sure that this could be worked up into a side dish for those medium-sized gatherings that were left out of your reckoning. Perhaps cooked with turkey stock? Perhaps with wild rice instead of brown, to make up for the lost meat?